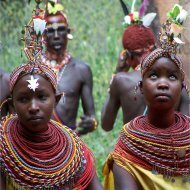 With a rich tribal history, the population of Kenya still maintains many separate identities while still being one nation. The advancement of Western ideas and modern technology has helped mix the population of Kenya, blurring the traditional tribal and nomadic boundaries. By various counts, there are anywhere from 40 to 70 different tribes represented within Kenya. Most Kenyans have left their old ways in favour of a more modern and urban lifestyle, but some tribes such as the Masai and the Samburu continue to live as their ancestors. These tribes struggle to continue their nomadic ways in the face of shrinking territory and further modernization of the nation. A 2008 estimate puts the total population of Kenya at approximately 38 million people, making it the 36th most populous nation in the world. By comparison, Canada has a similar population with only 33 million people, while the United States has over 300 million. The population of Kenya is growing at a rate of 2.76%. There are more people living in rural areas than in the cities. Approximately 40% of Kenyans reside in urban areas, with the remaining 60% living in the countryside. The largest city in Kenya is most definitely the capital of Nairobi, with over 2 million people. The next largest is the coastal city of Mombasa, with more than 700,000 people. In terms of tribes, the Kikuyu tribe makes up about 22% of the population, and the next largest tribe is the Luhya, at 14%. After that, are the Luo, Kalenjin, and Kamba tribes. Only 1% of the population is made up of non-Africans, usually Asians, Arabs or Europeans. Ironically, the most well known tribe of Kenya is the red-robed Masai, and yet they only comprise 1.5% of the population. Belonging to a specific tribe, can create a very strong sense of community and pride. But when a large number of tribes must co-exist within a democratic nation, there can cause social turmoil. Accusations of favoritism, particularly against the members of the large and politically active Kikuyu tribe are common. Along with high instances of malaria, typhoid and hepatitis A, there is a high mortality rate in Kenya. The average life expectancy is only 56 years, and is roughly the same for both men and women. Another factor that significantly effects the population is the spread of HIV and AIDS. It's estimated that 6.7% of the adult population has either HIV or AIDS, which means more than a million people have the disease. That said, experts see a positive and exciting trend towards a decline of HIV/AIDS patients in Kenya. The Kenyan People - What Are They Like?